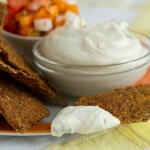 Vegan sour cream recipe made without soy. Mind blowingly delicious. Creamy, amazing. Make now. Add raw cashews to a glass container. Cover with water and soak for 6 hours, covered, in the fridge. Drain and rinse. Add to the jug of your high-powered blender along with all other ingredients: water, lemon juice, macadamia nuts, nutritional yeast, salt and pepper. Blend until smooth, about 3 minutes. You may have to tamper down the ingredients as you go. The mixture will be thick and creamy. Try to avoid adding water. 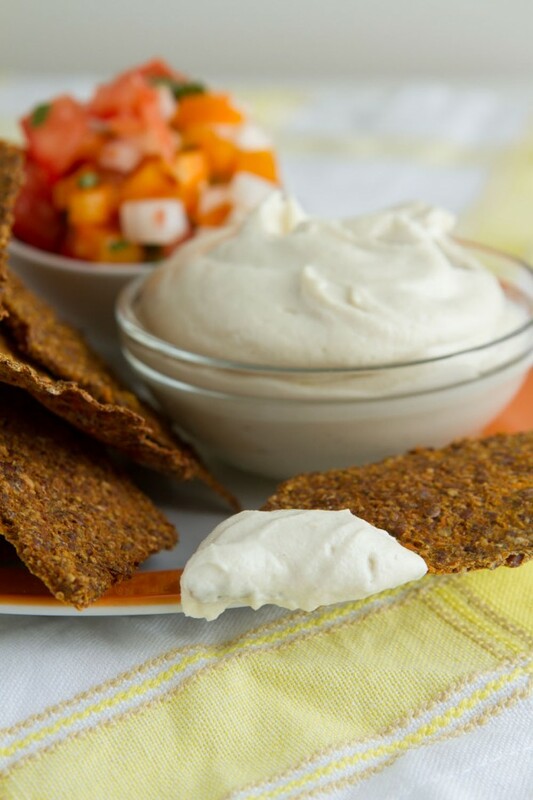 Serve with a batch of my Homemade Sweet Potato Tortilla Chips. Store in an air-tight container for up to 3 days. The sour cream will thicken up over a couple of hours. To make just a bit creamier, add a touch of water and stir. Nutritional yeast: makes this recipe. It must be added. Just won’t be the same without it. Cashews: you could try using another form of nut here. Perhaps almonds with skin removed or sunflower seeds? I have not tested this. White pepper: you could try with black, I just like white pepper because it’s mild, yet still has a slight taste of pepper without overpowering the dish. Soak time: this recipe will not work if you do not soak the cashews.